This is email I recently received about cornmeal. It was obviously on some blog, but this blather pops up often. If you've followed the link to column in question, you'll see that the original "research" is attributed to one of Texas A&M's research stations in Stephenville, TX. But it's not really research - it's just an observation on what happens when you don't plant the same crop two years in a row; in this case, rotating corn and peanuts reduces peanut pathogens. This is hardly news - it's one of the reasons agricultural scientists recommend crop rotation as part of an IPM program and has been for decades. Then we're referred to "further research" (at an undisclosed location) where cornmeal was shown to contain "beneficial organisms." Well, no, cornmeal doesn't contain organisms, beneficial or otherwise. 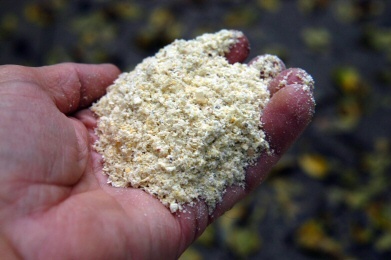 Microbes can grow on cornmeal, and in fact cornmeal agar is commonly used in labs as a growth medium for many species of fungi, and has been for decades. Nevertheless, we're informed that a gardening personality has "continued the study and finds cornmeal effective on most everything from turf grass to black spot on roses." This is directly refuted by Dr. Jerry Parsons, who by happy coincidence is an extension faculty specialist at Texas A&M. His informative (and hilarious) column on brown spots in lawns states "Lately there have been claims made that corn meal and a garlic extract is effective. This is absolutely false! Everyone trying to do the "environmentally friendly-to-a-fault" thing have been wasting their money. They would have been better off making corn bread and using their garlic for cooking purposes!" It boils down to this: if you have a healthy soil, it will probably contain diverse populations of beneficial microbes, including those that control pathogenic fungi. You don't need to add cornmeal - it's simply an expensive form of organic material. So you can ignore the directions in the article on how to incorporate cornmeal into the soil, or make "cornmeal juice" to spray on "susceptible plants." Just nuture your soil with (repeat after me) a thick layer of coarse organic mulch. This is my response to this recent email. This is great. Dr. Joe McFarland ran the research station in Stephenville that discovered the anti-fungal properties of cornmeal due to the impressive control provided by the tricoderma fungus in the cornmeal. That cornmeal works is irrefutable. Isn’t it interesting that these same anti-cornmeal people do recommend an expensive product from a chemical company that contains tricoderma. Cornmeal has and is a lot less expensive. If you have questions on this newsletter or any other topic, tune in this Sunday from 8am - 11am CST to the Dirt Doctor Radio Show. The call-in phone number is 1-866-444-3478. Listen on the internet or click here to find a station in your area. Products are available in the Dirt Doctor's Corner of your favorite garden center. Please share this newsletter with everyone in your address book and all your friends on Facebook and Twitter to help me spread the word on organics. As school begins, the weather cools, and the pace of life picks up again, have a great Labor Day celebration.